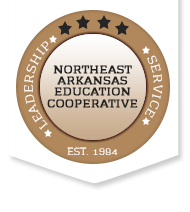 The Northeast Arkansas Education Cooperative serves as an intermediary agency between the Department of Education and the 14 member school disricts which we serve. Staff members use a variety of ways to determine the needs of the districts and devise plans to meet those needs whether it be through professional development or onsite coaching and support. Also, utilization of partnerships with higher education and other state and local entities provides additional resources and trainings to ultimately improve classroom instruction toward attaining the overarching goal of student learning and achievement.